The following trip report was published here but I thought that it would benefit from the addition of a few photos. 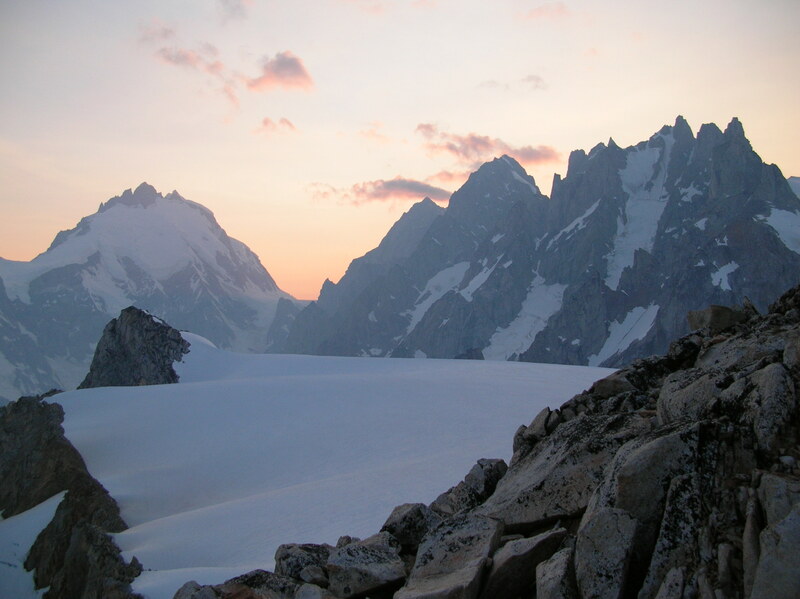 It’s an account of a new route that Tony McLane and I climbed in the Waddington Range this past summer. Immediate reactions to near death experiences rarely consist of the somber contemplation of the fragility of our continued existence that such events deserve. In fact they generally involve an asinine statement of the obvious, a great deal of profanity, and some nervous giggling. The climbs of glory lead but to the grave. Admittedly that would have been a little over the top (and macabre). It’s an effective survival strategy to make light of close calls and instead save the introspective navel-gazing for post-climb writings such as this. Herein, the application of a little structure transforms the chaos of the mountains into a coherent narrative celebrating adventure and achievement. The Plummer Hut is perched above the great trench of the Tiedemann Glacier. It was with a sense of unreality at being so suddenly deposited in such a place that Tony McLane and I stood amid a large pile of gear and watched the helicopter disappear (the boos from the self-propelled puritans drowned out by the sound of the rotors). As we unpacked our gear and prepared for our attempt on the unclimbed southwest face of Asperity Mountain, our eyes flickered constantly upwards to where calving seracs on the north faces of Mt. Munday and Mt. Waddington provided a reminder of the huge scale and heavy glaciation of the range. In the darkness just before dawn you can sense the outlines of the peaks above and it’s hard not to feel a little uncertain of your purpose as you trudge within your headlamp’s cone of light. It’s inevitable to ponder your puniness and insignificance in the face of the cosmic whatever (maybe a little humility is a positive side-effect of this otherwise generally pointless pursuit). The glacier below the face turned out to be as straightforward as could be expected. 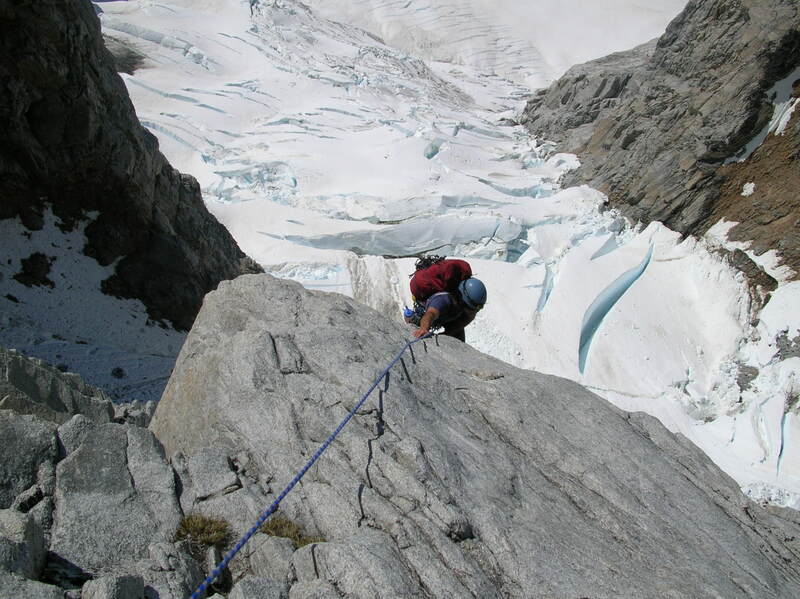 A single crevasse spanning the width of the glacier was fortuitously jammed with ice blocks that led directly to the single weakness in its otherwise overhanging upper wall. Some mixed climbing around a bergshrund then allowed us easy access to the toe of the buttress that forms the first third of Asperity’s southwest face. Tony started up the face, weaving up blocky and compact rock. I took over the lead after three pitches, just as the climbing got steeper and the rock became featured with more continuous crack systems. Squamish climbers at heart, we were in our element: jamming and laybacking on beautiful granite. Tony following on the lower buttress with the glacier we'd ascended that morning visible below. My block of pitches ended with a strenuous move over a small roof on cupped hand jams. Above loomed a sixty-meter corner split by a continuous four-inch crack. Tony grabbed our single four-inch cam and set off. 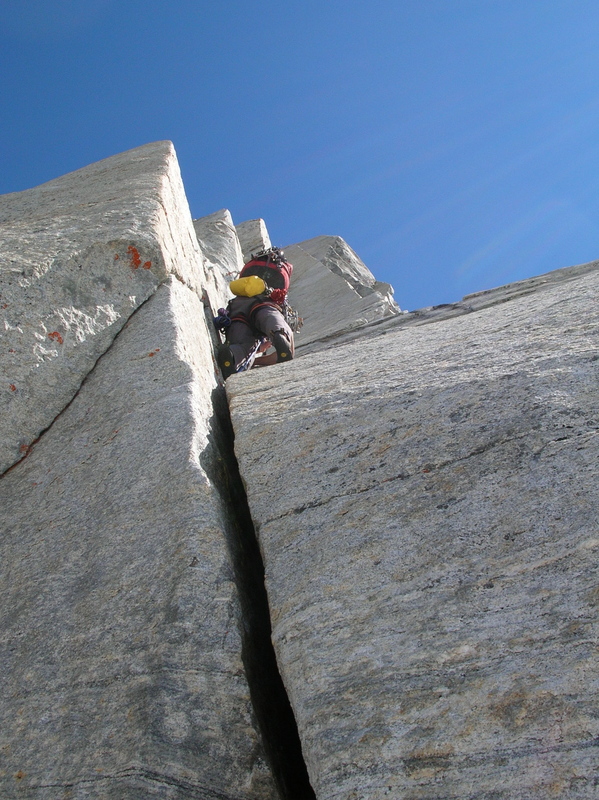 His seasons spent eluding the park rangers and climbing wide cracks in Yosemite paid off as near the end of the pitch with only a few pieces of gear between him and the belay, he slid the tipped out number four cam in front of him and arm-barred up the gently overhanging offwidth without even bothering to hang his pack. When I arrived at Tony’s anchor (hyperventilating and oozing blood from both ankles and a knee) I felt oddly optimistic about our progress. Tony sets off up the rope stretching pitch offwidth climbing. 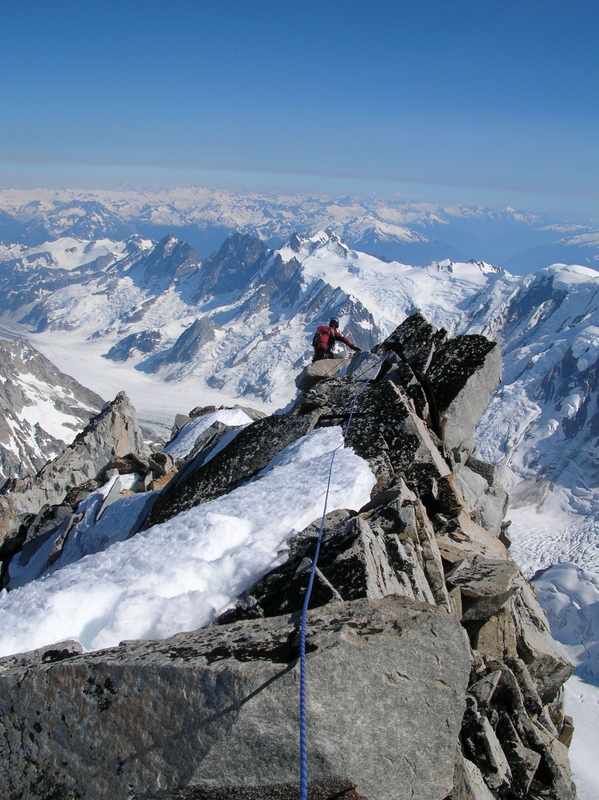 Above, the angle of the face relented and after one more short belayed pitch, we switched back into our boots and began to climb un-roped up intermittent snow couloirs separated by easy rock steps. Kicking and plunging up steep snow isn’t a very exhilarating form of climbing, but in spite of the exertion we were buoyed by our progress. The snow couloirs ended as the face steepened below the summit. We had hoped to climb a ramp that led directly through this upper rock buttress but found that access to it was barred by a frigid waterfall. Instead we traversed left to a neighboring ramp system where decomposing rock caused us to rope up again. The summit felt close and when the ramp ended on the northwest ridge I continued climbing, knowing that Tony was moving simultaneously below me on the other end of the rope. Asperity is a mountain that supports the old aphorism that the summit is only halfway (unlike for example the Chief in Squamish). 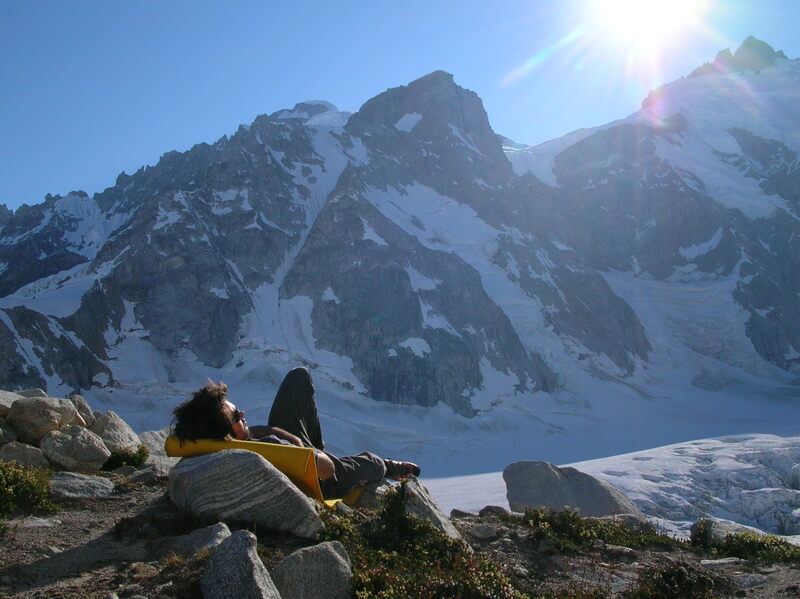 We weren’t entirely ignorant of the challenges that lay ahead on the descent and so we kept our self-congratulatory summit lounging to a minimum. 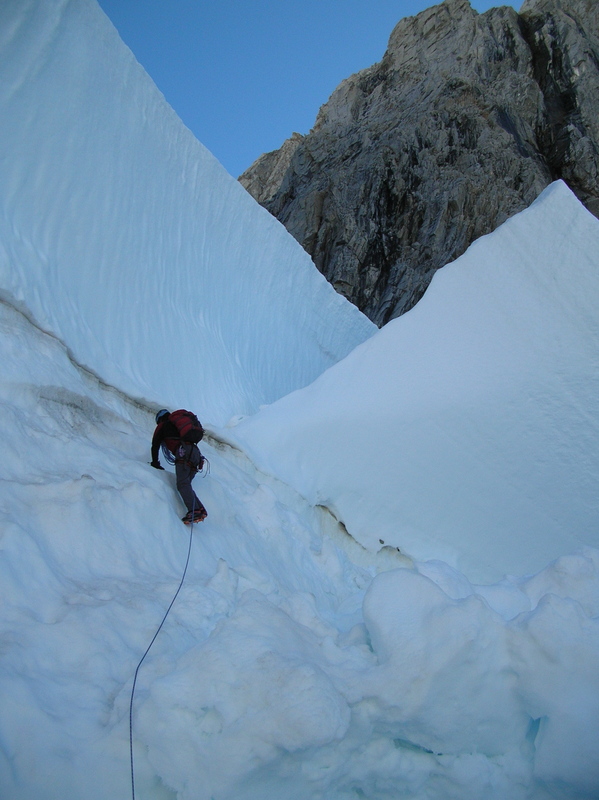 As we began down-climbing the east face towards the col with Serra Five, the snow became increasingly icy. We had shown a small amount of foresight by bringing an ice screw, but we quickly discovered that “icy enough to be nerve-racking to down-climb with a single lightweight axe” does not necessarily mean “icy enough for solid v-thread rappel anchors”. As a result, we continued down climbing until the slope changed from being disconcertingly firm to a mildly terrifying gleaming blue. A large serac cuts across the bottom of the east face but the prospect of traversing around it on more fifty degree ice was rather unappealing. With burning calves and a tight grip on my axe I started making a v-thread rappel anchor. I reassured Tony that I’d made hundreds of them and then proceeded to misalign the holes amidst what I’d like to believe was an uncharacteristic flurry of profanity. 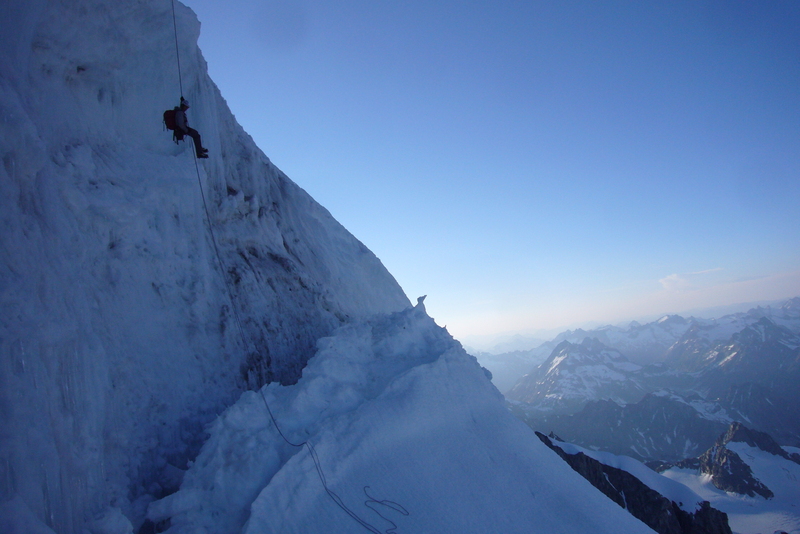 Eventually I was hanging at the lip of the serac, looking down to see the ends of our two sixty meter ropes were dangling well shy of solid ground. Tony was not particularly overjoyed with the situation and the ensuing traverse did little to improve his outlook. One particular incident, the result of his creative attempt at chopping steps in the ice, nearly ended in disaster and would have been enough to end the climbing career of any more sensible person. Rappelling the serac above the Serra V - Asperity Col.
All of this took more time than perhaps it should have and when we eventually gained the col after a few diagonal rappels, it was clear that we would be sleeping there for the night. After a quick meal, I busied myself moving rocks around in an attempt to create a somewhat flat and sheltered bivy spot. Meanwhile, Tony adopted a different approach and simply curled up in a semi-seated position amidst some jagged-looking boulders (again, he’d trained for this in Yosemite when, with the rangers in hot pursuit, he’d attempted a nighttime barefooted solo of Swan Slab and become benighted on cramped ledge in only a t-shirt). Cramming your feet into frozen boots first thing in the morning is not a pleasant sensation. However, as the sky began to brighten, frozen toes seemed like only a minor sacrifice in order to be moving again. The couloir that drops from the col towards the Tiedemann was not only a bit icy, but as soon as the first rays of sun touched the upper southeast face of Asperity it began to live up to its reputation as a bowling alley. 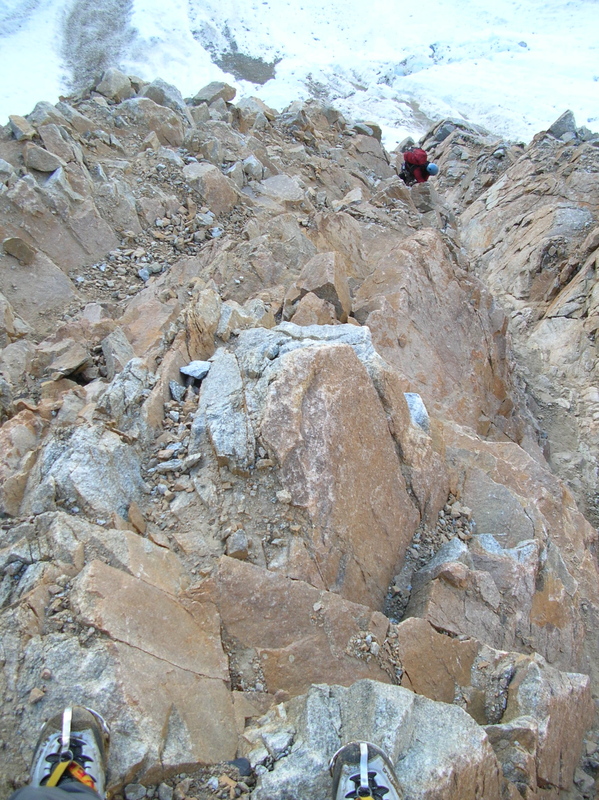 Having had enough of the ice, we traversed to a rib of rubble that ran to the parallel the couloir. At least on the rib the majority of the rock-fall was self-induced. When the rib petered out, we made a rope-stretching rappel over the monstrous bergshrund and it was while pulling the ropes that a lone rock sailed alarmingly near to my head. A haze of smoke from nearby forest fires did little to filter the sun’s rays as we traversed tediously on increasingly slushy steep snow. The final section of the descent was down a feature called Carl’s Couloir and right at its entrance we found a nice ledge where we sat and admired the jumbled glaciers and jutting granite buttresses that surrounded us. My impatience to get off the mountain began to dissipate and after a quick snack we started down the couloir feeling much better about things. To our pleasant surprise, the snow in the couloir turned out to be both softer and lower angled than we had expected and for once we were able to down-climb facing out from the slope. Once again, a sixty meter free-hanging rappel was required to cross the bergshrund (I was becoming increasingly indebted to Tony for having vetoed my suggestion that we not bring the six millimeter tag line on the climb). 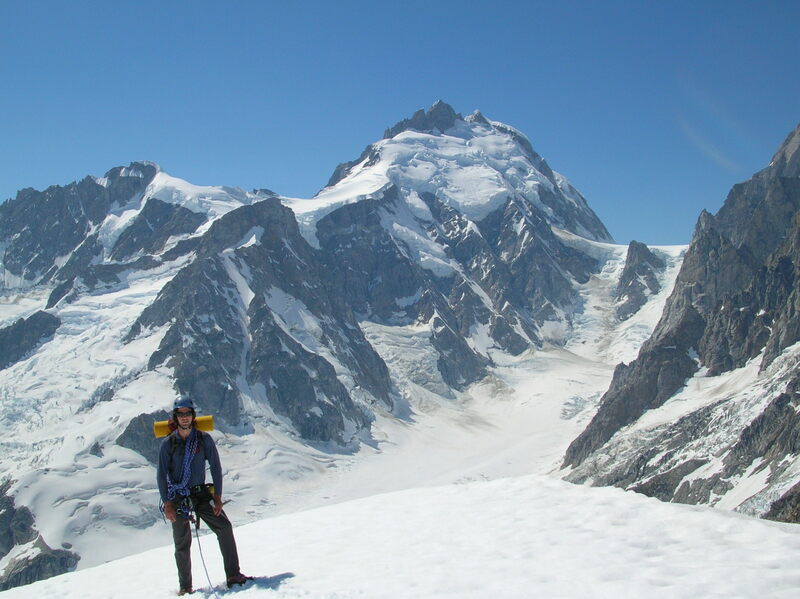 A section of down-climbing on exposed glacial ice led to the Tiedemann and a slightly circuitous slog to Sunny Knob. With our camp and its helicopter-borne amenities so close, we pressed on up the long slopes that lead from the Tiedemann Glacier to the Plummer Hut. All of our food and a great deal of our energy was depleted by this time, and our final push for the Hut was at the kind of pace normally reserved for summit pushes on Everest (thankfully there are far fewer climbers in the Waddington Range than on Everest so we were spared the indignity of having anyone witness our suffering). We returned to camp with a renewed appreciation of food and sleep. It was not until after a big meal and a sound sleep that the chaos of big mountains became a smug memory of a successful adventure. Nice stuff Nick. The lions in winter brings backs lots of great memories, like battling up some runout gully in the dark then cutting through a cornice and pulling over to the lights of vancouver. I spent many a winter day there cutting my teeth. I think it was Robin Barley and Peter Rowat who started winter climbing up there in the 70’s, including that coulior you did on the south side. I never got around to that one and always wondered what the story was on it. Have you climbed the north face? It was Don serl and your friend Tony’s Dad that first ticked that one. If you like that stuff keep your eye on the Fluffy Kitten wall up Stawamus creek. It has a nice blend of alpineish mixed and typical squamish style thin ice when it comes in. That picture of Scottish tale instantly reminded me of it. As well, compared to the lions the approach is a joke. Nick, nice work. You’re blog is fantastic — I just wish you’d stop ragging on skiing because I know you had fun this weekend! Hahaha.